A mother of four, Maria went through a financial crisis after her husband passed away. 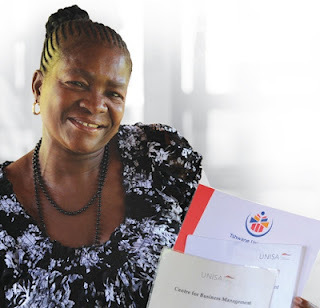 Realising that the only way to ensure a better life for herself and her children was through education, Maria approached a number of different banks and financial institutions for a student loan – without success, until one day a friend told her about Eduloan. Maria’s journey to success began when Eduloan granted her the study loan she needed to enrol for a B.Com degree – and she hasn’t looked back since. Today, after years of being a satisfied Eduloan customer, Maria has made use of Eduloan a staggering 44 times – completing not only her B.Com degree, but enabling three of her children (the fourth is still in high school) to enjoy the benefits and opportunities of a tertiary education. As a result, they are now all successfully employed and financially independent while Maria herself is a Head of Department at Abel Motshwane Secondary School in Mabopane. "I approached other banks but could not get a loan. Eduloan came to my rescue and changed my life,” Maria said. According to Maria, even the application process was so much easier with Eduloan than any of the other banks she tried. Her first study loan was approved in just 48 hours. “In my everyday life I advise my learners, my students at school, my colleagues, my neighbours and my friends on how Eduloan changed my life. 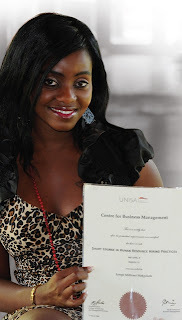 I tell them to approach Eduloan if they want to fund their studies." Maria funded her children’s tertiary education through Eduloan too. Her daughter, Lesego, has achieved a diploma in Human Resources Hiring Practice and is now financially independent.